I’ll confess that I was a bit skeptical when I began watching The Birds. I was thinking to myself, “this is a two hour movie about a woman being pecked by some whacko birds. How interesting can that be? Sounds like a bunch of bird doody to me!” And as is usually the case, I was right! 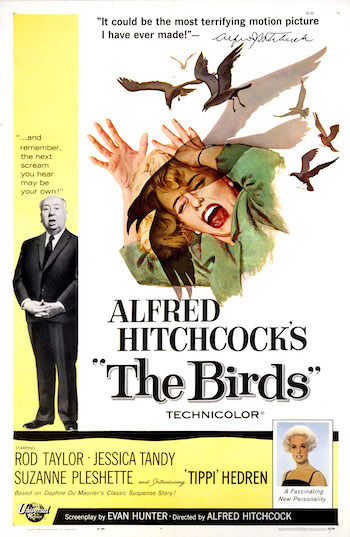 The Birds is all about the world turning to bird doody as Alfred Hitchcock unleashes a very effective apocalyptic vision of nature rebelling against man! And by nature, I mean some stinky birds. Tippi Hedren is this picture’s blonde Hitchcock starlet and she does a very good job being blonde. The movie opens with her in a bird shop (foreshadowing!) and she has an encounter with a guy who somehow saw her in court one day. I never really got how these two knew each other, but if that elliptical explanation for them coming into contact with one another speeded us closer to our first bird attack, so be it! She goes to drop the birds off at his place, but learns that he’ gone to Bodega Bay for the weekend. This blonde woman, Melanie, knows a great practical joke when she sees it and is determined that this lovebird gag is going down one way or the other. You know what that means. Road trip to Bodega Bay! Bodega Bay is a postcard perfect little seaside village that is just the type of place where bad things are prone to happen. It’s an age old technique: contrast the apparent beauty and quietude these places exude with the stark and ugly horror that inhabits (or invades) these places. A bird attack in Gaza probably wouldn’t have the same impact on the viewer. Melanie figures out where her man friend lives and motors out there on a boat. She goes out to his place on the other side of the bay, leaves the lovebirds and hightails it back to the other side. The guy, Mitch, sees her and drives around the bay after her, meeting her at the dock. Just before she gets into the dock, she is attacked by a dive bombing seagull. Huh, that’s odd. Why would a seagull do that? Probably just a fluke, nothing to get alarmed about, etc. Mitch uses this as an excuse to take her back to his place and get her healed up. Please, no jokes about one pecker helping another! It turns out that this place Mitch stays at on the weekends is his family home. That means his old overbearing mother and young sister live there. Mitch’s sister is having a birthday party the next day and Melanie is somehow talked into staying for it. During the party, everyone is attacked by birds. This makes it more enjoyable than any birthday party I’ve ever been to. The movie then starts to kick it into high gear and the bird attacks take center stage for the remainder of the movie. Hitchcock does a great job pacing this movie. Obviously it can’t be two hours of birds going cuckoo, so Hitch spaces out the bird encounters strategically. He also designs each bird scene so that the danger elevates each time, increasing the severity of the attack or the birds’ numbers or whatever. By building the tension this way he avoids overexposing the birds early in the film and thus lessening their impact once they attack en masse and for sustained periods. 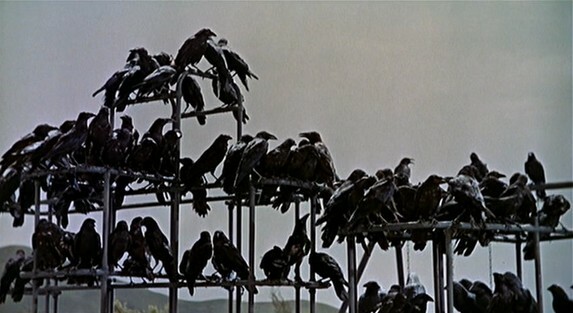 As the film draws to a close, the birds assume an inevitability, literally becoming a force of nature. Their numbers seem infinite, their motives are at once obvious and inexplicable, and their power absolute. The final act of the movie is great and is mimicked by no less a film than Night of the Living Dead. You can’t watch Mitch going through his family’s house, boarding it up, moving from room to room checking over doors and windows, battling against the army of birds as it tries to peck its way into the house and not conjure up images of Duane Jones doing the exact same thing as he attempted to keep an army of zombies out of a farmhouse. Hitchcock stages some great scenes designed to frighten and draw the viewer into this world where birds have gone mad. Unlike so many horror movies, Hitch doesn’t feel like he has to club us over the head with his scenes of terror. 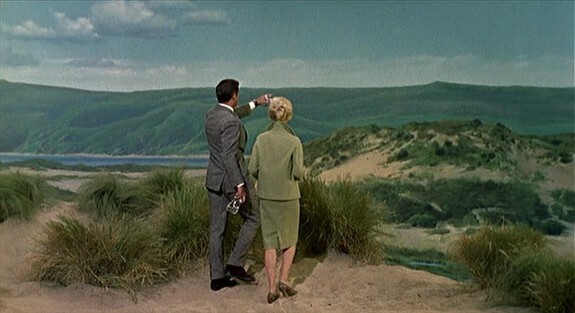 The movie never uses any music in the score, going only with bird sounds to good effect. In lesser movies, scary moments are telegraphed by annoying music and are amplified in case we still didn’t get it by characters screaming and behaving like complete spastics, even when that might not necessarily be the response a real human being would have. 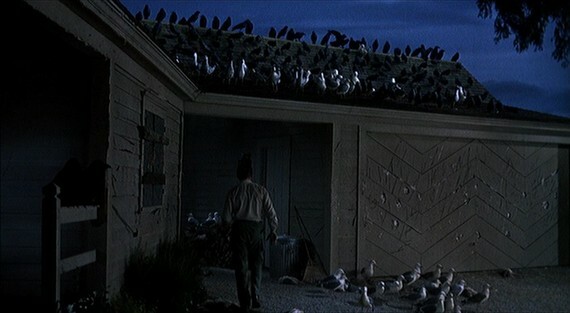 The Birds doesn’t treat us or its characters like fools, which only adds to the genuinely unsettling feeling that pervades it. You’ll need to clean your bird cage after watching this one!